It’s no secret that remote work is on the rise. However, it is quickly transforming from a work style that is available only to freelancers or senior employees to a fully integrated way of doing business. With 43 percent of employed Americans working from home at least some of the time, the importance of cultivating high-performing home offices increases. I have been working remotely, mostly from home, for over five years. While my home office is ever evolving and often takes a back seat to my actual work, there is no denying the value of a well thought out home office haven! As a remote worker you have the freedom to create the environment that is most conducive to getting your best work done! Considering that my own home office may be overdue for some major upgrades, I began to research the plethora of products on the market. I was quickly reminded that office equipment can be expensive and that choosing the right products can be overwhelming. Hopefully, my research can save you some time and provide you with peace of mind. Some of these products are new on the scene, while others have stood the test of time. Additionally, I am working under the assumption that you already have a computer you love! As a home based remote worker who eliminated your commute, it’s also likely that you eliminated most of the walking that was built into your day. No longer do you walk from your house to the car, from your car to your desk, the conference room, or from the office to that local cafe. Combat your newly sedentary lifestyle by incorporating a standing desk into your home office. 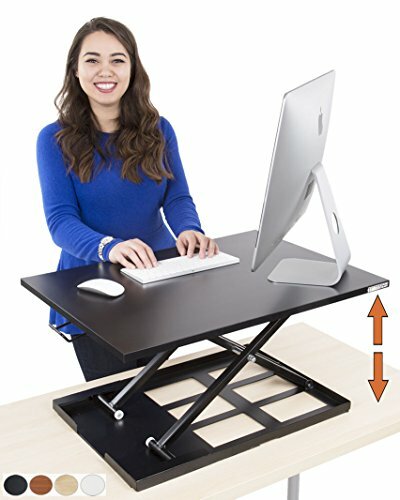 If you are looking for a whole new desk, check out the Standing Desk by The Stand Up Desk Store. It is our top choice for a standing desk. Adjustable up to 48" it’s smoothly operated pneumatic lifting mechanism allows you to adjust from sit to stand throughout your day. It has two heavy-duty steel legs that support the desk’s beautiful birch desktop, supporting up to 35lbs of devices. This desk topper goes up and down with ease in a matter of seconds, with premium pump assisted lift. Choose from a range of 7 inches to 16 inches. Additionally the large surface leaves plenty of work space. Best of all, no assembly required - just open the box and start standing! 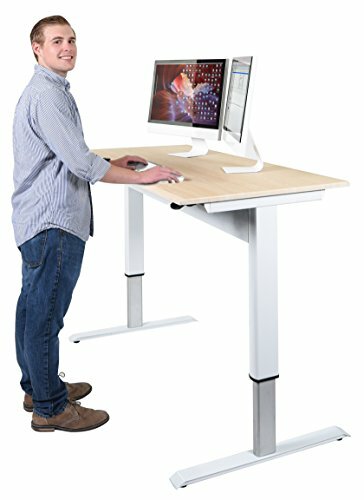 Unless you are ready to commit to a full-time standing work station, consider these unique ergonomic desk chairs. The Classic Aeron Task Chair by Herman Miller is nothing new, but it remains one of the best office chairs out there! 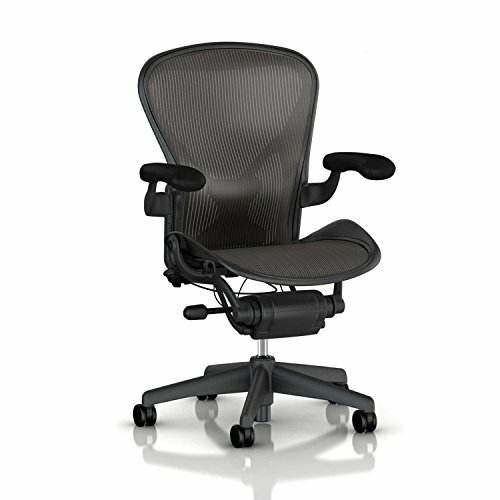 If you want a chair that does no harm, the Classic Aeron Task Chair is the way to go. Herman Miller's patented Kinemat® tilt mechanism lets your neck, shoulders, hips, knees, and ankles pivot naturally. Unique breathable Pellicle suspension dissipates the body heat that builds up while you work, keeping you cool and comfortable, while providing unparalleled support. The "waterfall" front edge of the seat takes the pressure off your thighs, so your blood keeps circulating, keeping you alert and focused. The pioneering PostureFit® mechanism supports the way your pelvis tilts naturally forward, so that your spine stays aligned and you avoid back pain. Plus this product comes with a 12-year Herman Miller warranty with Official Born-On-Date sticker. 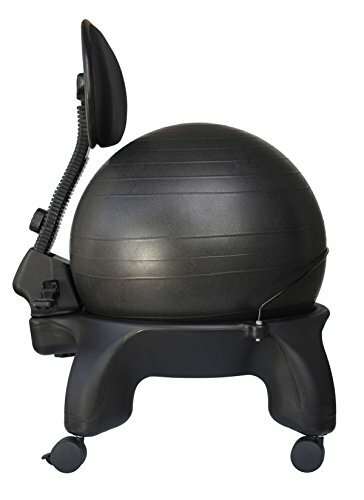 If you are looking for a chair that provides comfort and exercise, the Isokinetics Ball Chair may be the best fit. The stability ball seat, when used correctly, provides a subtle core workout throughout the day. Plus if you have the need to fidget, this chair is great way to release some energy while remaining focused on your work. The 60mm (2.5 inch) wheels, provide a smooth and quiet rolling experience. 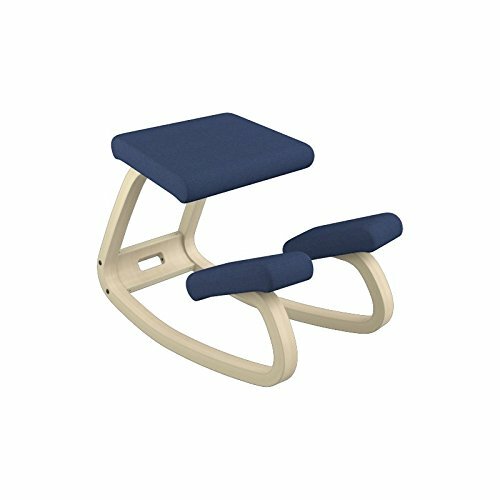 There is a weight-bearing adjustable seat back that provides back support. Original purchasers get a 30 day money back guarantee and a lifetime warranty against manufacturer defects. Finally, if you are seeking a chair that promotes good posture, healthy circulation, and high blood oxygen levels, while energizing your body and mind, then the Variable Balans Original Kneeling Chair by Varier is our suggestion. This chair promotes natural, upright posture, strengthens core and abdominal muscles, follows the natural movement of the body, prevents tension in neck and shoulders, enhances deep breathing, improves concentration through increased blood circulation and oxygen supply, energizes and combats tiredness, reduces pressure on vertebral discs, and is made from New Revive polyester fabric that is derived from 100% post-consumer recycled plastics. If you're gonna work from home, you're gonna need devices. With devices come power cords. We have all been there, you need a power cord with surge protection and you just run to the local convenience store and buy whatever they have. Or perhaps you just unplug and re-plug as you go, bypassing the purchase entirely. After all it’s just a surge protector right? Wrong. 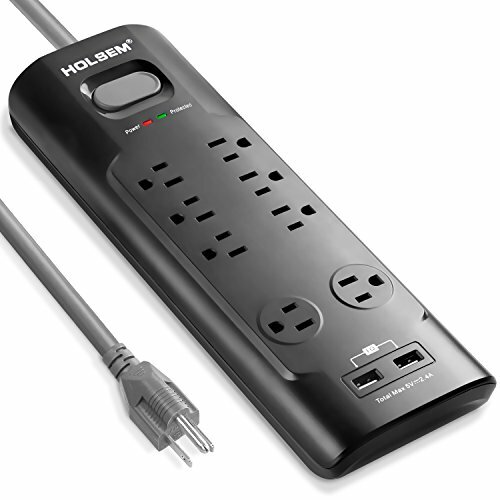 This Surge Protector by Holsem is the way to go! This baby has eight AC outlets, two of which are widely spaced for bulky plugs. You’ll also get two Smart IC technology USB ports that deliver the fastest possible charge speed up to 5V/2.4 A per port. The 6 ft extension cord is ideal for home office, let’s be honest wall outlets aren’t always in the most convenient places! With a 1200 joule energy rating this product is ideal for computers and laser printers. There are keyhole slots on the back allowing you mount it to a wall or baseboard horizontally. It’s ETL Listed and the FCC Certificated Surge Protection feature safeguards your expensive computers, smartphones and all other electronics from voltage fluctuations, surges and spikes. You also get overload protection with the double break overload switch and it’s made of flame retardant material which is able to withstand temperature up to 1,380℉(750℃). Finally, this product comes with a worry-free 24-month warranty, 30-day no-hassle return & refund guarantee and lifetime technical support. If you have outgrown your laptop, you will need to find the best wireless keyboard to pair with your sleek and spacious desktop monitor (or two). 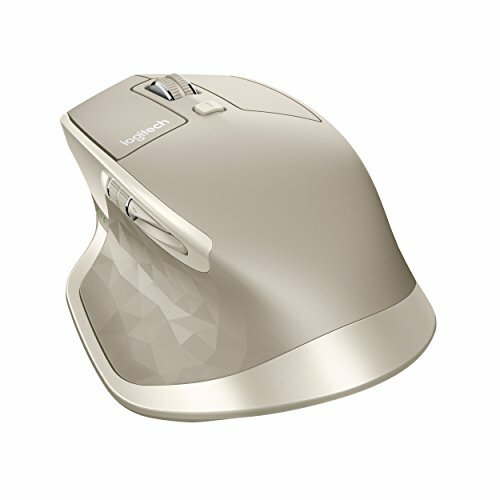 We recommend the Logitech Bluetooth Keyboards for Mac and Windows computers. Logitech wireless keyboards stand out, combining superior efficiency with no compromise in aesthetics making them the best bluetooth keyboards of 2017. This keyboard has the same layout as the Mac keyboard and offers amazing whisper-quiet typing. When you bring this home, you can shift seamlessly between all of your bluetooth enabled Apple devices with a single click. With whisper quiet typing and automatically adjusting back-lit keys for soft viewing this product is a wonderful addition to your home office. A multi-tasker’s dream, this keyboard offers connectivity between multiple devices. If you still prefer to use an external mouse over a touch-pad, you’ll majorly dig this Wireless Mouse by Logitech. Crafted to support wrist comfort, this mouse has advanced gesture features. You have the option to connect to multiple systems with just a click. The thumb wheel makes for easy horizontal scrolling, while the dark field laser sensor tracks flawlessly even on glass and high-gloss surfaces. This tech pet is optimized for Windows and Mac. Additionally by installing Logitech Options you can extend thumb wheel capabilities, such as invert scrolling direction, reproduce touch-based gesture, navigate tabbed content, switch apps, and much more. Finally, you get 40 days of battery life on a single charge. While we love the idea of going paperless, sometimes you still need paperwork to get the job done. Without a printer, you must disrupt your workflow to drive to the local Kinko's where you end up paying for time on the computer and pages printed. What a drag! 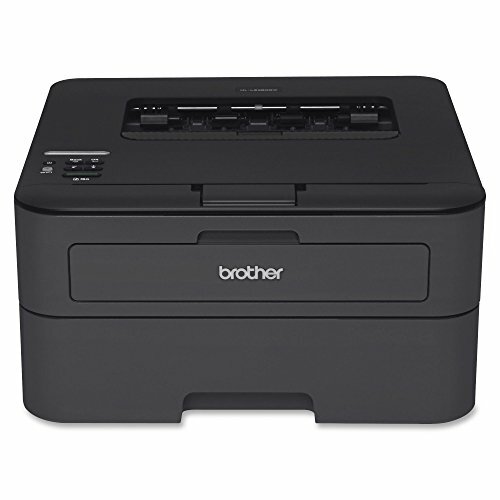 If a basic printer is all you need the HL-L2340DW Compact Laser Printer by Brother is what we recommend. This beauty is budget friendly, flawlessly wireless, puts out sharp prints, and is compact enough for a small office desk. This fast, reliable monochrome laser printer is designed squarely with the Home Office user in mind. It prints sharp, professional black and white pages at up to 2400 x 600 dpi resolution. 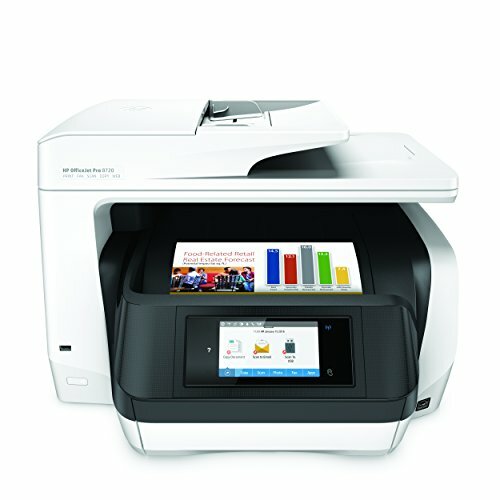 Print speeds of up to 27 ppm supports automatic duplex printing. The simple wireless setup supports a 802.11 b/g/n connection. Finally, it comes complete with an adjustable 250-sheet capacity paper tray. If you’re looking for more bells and whistles and less money wasted on Kinkos scanning and copying fees, then you’ll want to check out the OfficeJet Pro 8720 by HP. With mobile printing technology you can print from anywhere using your smartphone or tablet, all you need is the free HP ePrint app. AirPrint allows you to print even without a network using Wireless Direct printing. There are no trays or extensions, so you get private and hassle-free output. Advanced duplex capability provides single-pass duplex copy/scan. You’ll spend 50% less per page compared with other lasers printers, but get that same professional-quality and vibrant color. The built in touchscreen will help you navigate all jobs with ease and you’ll be done in no time with the 24 pages per minute for black ink and 20 pages per minute for color ink. Working from home means video conferences. 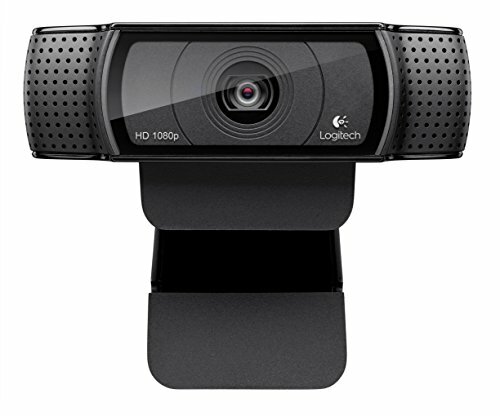 Whether your monitor lacks a webcam or you just want an upgrade, this small and flexible Webcam by Logitech is a great way to put your best face forward! With full HD video recording (up to 1920 x 1080 pixels) and H.264, a highly efficient compression technology lets you record and compress at the same time. You can expect fluid video motion and rich colors, while aiming anywhere or switching to wide field of vision. You can also pan, tilt, zoom, and photo capture, while the webcam works to track your face and detect motion. The camera automatically corrects low-light settings making it perfect for those late night and early morning meetings with distant teammates. There are two microphones, one on either side of the webcam, that capture natural stereo audio. Whether you’re using video chat or resorting to conference calls, the quality of your audio is an important part of humanizing your remote work experience. 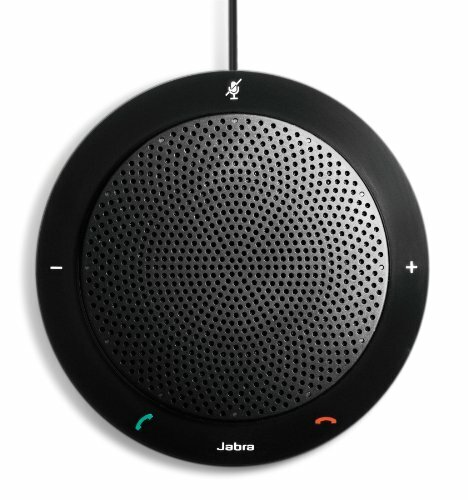 If you are in the market for a speaker phone, we recommend the USB Speaker Phone by Jabra. This speakerphone is ideal for one-to-one and small-group conference calls. With crystal-clear conversations during Zoom video calls, you’ll wonder how you ever got by without it! Additionally, you’ll love the intuitive on-device call controls and external ringer. Easy to transport, this compact design is enhanced by its cable management feature and travel case. Also enjoy the headset port for private calls. 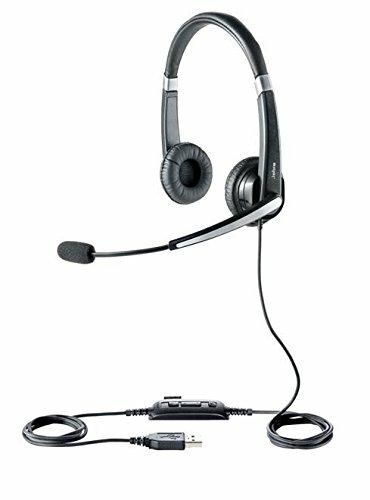 If for some reason you prefer the headset over the speaker, check out this stand alone USB Headset also by Jabra. Enjoy high-definition sound with HD Voice and get crystal clear intelligible communication. The revolutionary Peak Stop technology immediately removes potentially harmful loud sounds and keeps the sound level within a safe range. You’ll love the intuitive call control and seamless connection to all leading UC applications. With its noise cancelling microphone, it reduces unwanted background noise like barking dogs, crying babies, or yard work. Also worth noting is the flexible boom tip arm that ensures ideal microphone placement. 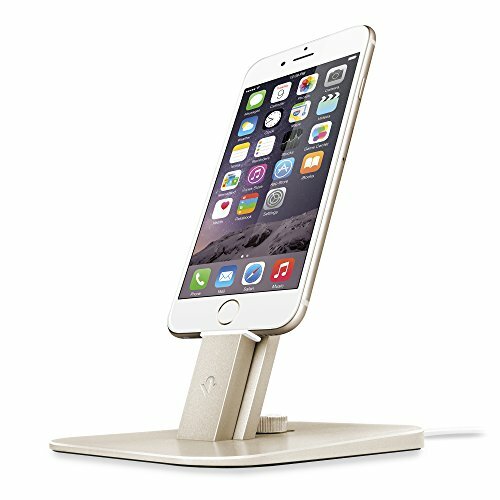 Perhaps more of an amenity than an essential the HiRise Deluxe iPhone Charging Port by Twelve South is a fabulous way to dress up your home office. Better yet, it’s easily one of the best charging stands on the market. This port comes with a MFi-Certified Lightning and Micro-USB cables for charging your devices. Since this product comes with its own cables, you can use original cables elsewhere, like in your car, by your bedside, etc. The Micro-USB cable allows you to charge your battery cases while on your iPhone. One of best features of this little stand is that it adjusts to fit so many cases. With rear support and multiple-height clips, you won’t have to give up your dock when choosing your next case. Last but definitely not least, no home office is complete without external file storage. Don’t waste hours deleting files just to waste hours more worrying or realizing you deleted something of value. While Cloud Storage is a great resource, it’s important to diversify! 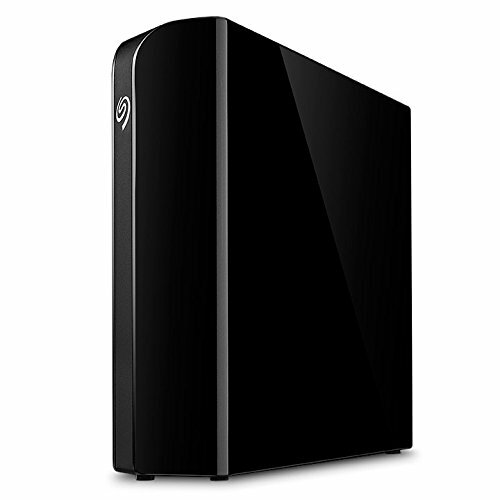 When it comes to external hard drives for your home office look no further than the Desktop External Hard Drive by Seagate. Its powerful technology combined with top notch design sensibility makes it everything a backup unit should be. Sleek and powerful with tons of storage space, this product includes two USB 3.0 ports that allow you to transfer files at speeds up to 160mb/s. Enjoy cross-platform compatibility, exceptional reliability and speed in phenomenally high capacities up to 8TB. 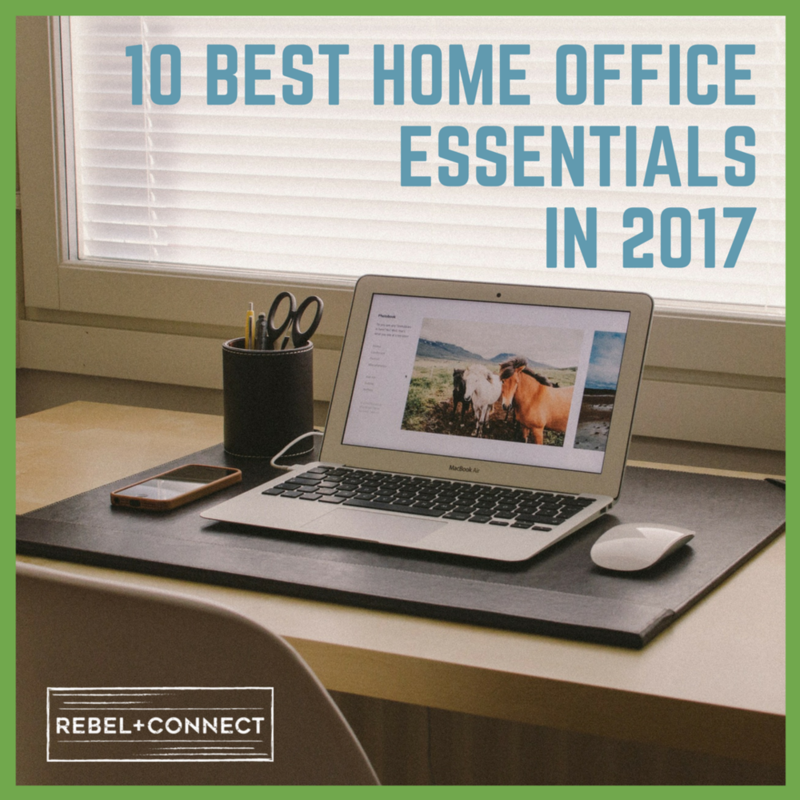 So there you have it folks, the “10 Best Home Office Essentials In 2017” are desks, chairs, power cords, keyboards, mice, printers, webcams, audio equipment, charging ports, and external hard drives. These are the products we recommend. If you know of a superior product, leave a comment below. We will gladly check it out and consider swapping it out here and in our marketplace. Can't find the information you are looking for join the Think Tank and start the conversation you want to have! The Future is in Collaboration!